New technologies are being integrated into Automotive OEM products every day as the industry experiences a dramatic demand for connectivity. This paradigm shift has created unique issues surrounding security which experts agree, leaves vehicles vulnerable to a myriad of cyber attacks. If you think about it, the car in your driveway is a “mobile device” that weighs thousands of pounds and moves at speeds in excess of 200 miles per hour. Protecting this connected device now becomes more than just data security – it means preventing the loss of human life. Automotive security vulnerabilities are apparent throughout the lifecycle of the vehicle. Automotive IoT security vulnerabilies create a larger surface area for bad actors to attack. 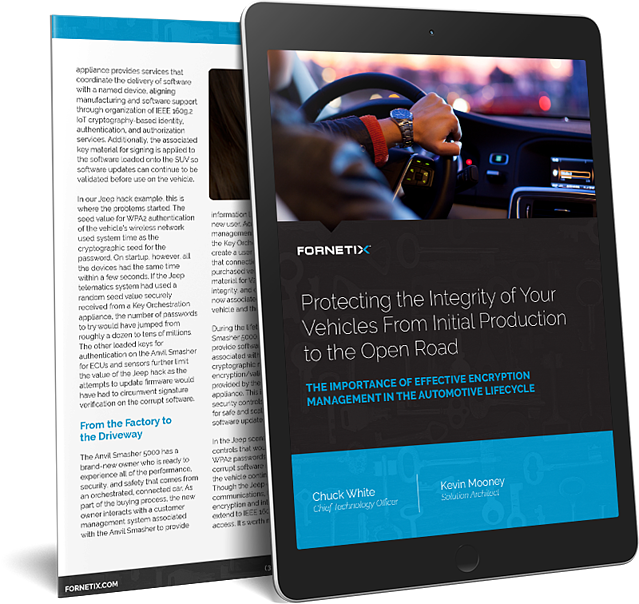 Encryption key management can help secure all aspects of the automotive lifecycle from production to the open road.